Books are timeless, failsafe and make for a great Christmas gift. 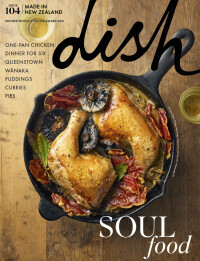 Here, the dish team have reveal their favourite food-related titles, so that present-buying may be a little easier this year. From a Roald Dahl classic to Ottolenghi's newest book, SIMPLE, there's something for everyone's bookshelf. Three sisters flee Iran and settle in Ireland, thinking that the past will be left well behind them. They encounter mixed reactions from locals when they open an exotic pastry shop. Some are affronted, others become ardent supporters. The recipes add an extra dimension to this book. Anything by Yotam has a place on my bookshelf and in the kitchen. A must-buy for anyone who enjoys cooking. This memoir ‘of a reluctant chef’ traces, with immense wit and flair, her journey from rural childhood (filled with her bohemian parents’ parties and her French mother’s incredible food), to neglected young teen – who had, for a whole summer, to fend for herself – through to her triumphant finale as owner of celebrated New York eatery Prune. Moving, entertaining, truly devourable. For a good month after reading this charming tale, set in a small Italian town, at every opportunity I embraced my inner Raffaella. She's the beautiful (of course) protagonist – whipping up herb-laden pastas and adding rustic flourishes to every meal. The ultimate beach read. It’s light, quirky, charming and an oh-so sweet romantic comedy of mistaken identity and bringing people together with food. The perfect holiday read that will leave you with a smile. This was gifted to me and it's now my most used recipe and reference book. As someone with food intolerances, I’ve found this book wonderful. It’s taught me a lot about nutrition and how to practically apply ideas and principles to my life. I learnt how to feel good, without believing I constantly need to go on a fad diet. I know it's classed as a children's book but it's an absolute classic. Apparently Roald Dahl actually wrote his books for adults, as he wasn't the biggest fan of children. While I'm here I might as well mention one of Mr Dahl's other books – James and the Giant Peach. This is also deserving of a spot on your bookshelf. I love cookbooks but this compilation of short stories, from chefs and food writers around the world, really stands out for me. I first spotted this Lonely Planet book while working at Whitcoulls, in my last year of university. After picking it up many times I finally bought it. Each recount involves food, often travel-related. Transport yourself around the globe through funny, interesting and inspiring memories of those with an undeniable passion for food. The story of an alluring and mysterious woman who upsets the locals in a small, religious French town by opening a decadent chocolate shop. The magic of food and the way it changes people's lives is delicious. And the 2000 movie with gorgeous Juliet Binoche and Johnny Depp is stunning too. Packed with delicious, authentic, easy Italian recipes, I absolutely adore this book. I feel like am recreating 'Italy-at-home' whenever I use it. Though it’s not a new book at all I would heartily recommend reading (or rereading) this. Since his tragic passing, I’ve felt nostalgic for this brilliant book that perfectly captures the madness, camaraderie and genius of those who choose to work in food. I’ve loved it since I first read it a decade ago. So many fresh, simple but evocative dishes. She has a warm and chatty writing style I just love.